So, funny story: last night around 2:30am, I woke up with chest pains, nausea, and a tingling sensation in my left arm. Hilarious, right? But wait, it gets better. Even though I know good and well what those signs rather forcefully imply, I refused to believe that Little Ol’ Me could be having a heart attack. And to prove my point, I wobbled all the way to my laptop and zipped over to WebMD.com, which, unfortunately, did not support my self-diagnosis. I would’ve looked for another site, but by then I was getting dizzy, so I stumbled back to the bathroom, chomped a couple of aspirin, and called 911. Five minutes later, there was an ambulance parked outside my front door. Before they could unload the gurney, I stepped out, explained the situation, and hopped into the back of the vehicle. They ran some tests, took my blood pressure, and said that they didn’t think it was a heart attack, but they’d like to take me to the hospital, just to be sure. I went back in the house, woke up Jonno, gave him the short version, told him that I’d be back in a bit and not to worry. He was totally NOT interested in staying behind, but eventually I convinced him that everything was going to be fine and that he’d be much better off staying in bed with the hounds. I’m lucky I caught him when he was sleepy. Him: Hey, buddy, how you feelin’? Me: Mmm. Feels like college. I was in and out for the next hour or so. Eventually, malenurse came back and told me what I’d been dreading: that I was not, in fact, having a heart attack, but rather a severe case of indigestion. You hear those stories all the time — “That fatass wasn’t having a heart attack, just heartburn!” — and you can’t help but think, “Damn, what a loser”. And so, I turned out to be a loser. A very, very, very happy loser, but a loser nonetheless. As soon as I was discharged, I hailed a cab and got home at 6:00am. 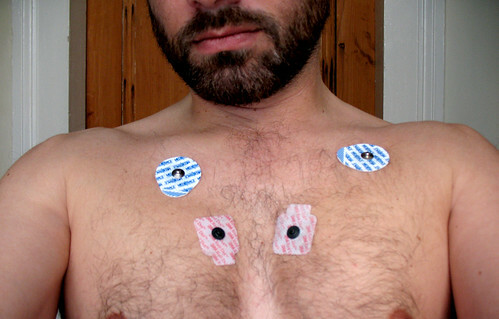 I was too lazy to get the stickies off, and they weren’t bothering me, so I slept with them. Which was much more comfortable than ripping them off before my shower. So, what’s the sitch, you ask? Worst case: I may have a coffee problem. I should point out that I’m kinda lighthearted about all this because (a) everything turned out fine, and (b) I have pretty good health insurance. I couldn’t imagine going through that without some kind of coverage. Even though it was just indigestion, it was scary at times, with all the chest pain and swooning. I’m thankful that my concerns weren’t made worse by worries about how I was going to pay for the care. Let me put that another way: SUPPORT UNIVERSAL HEALTH CARE. Oh, one more thing: if you’re in New Orleans and you find yourself possibly having a heart attack at 2:30 on a Wednesday morning, I highly recommend Touro Hospital. Had Mel Gibson ever been there, he’d want to rethink his position on Jews and all the world’s problems. Either I’m getting old, or David Vitter’s getting dumber and more annoying. But most likely, both. Wow. I'm sorry to hear about the scare. I went through the same situation in December. Minus the cute EMT and nurse.It was pretty scary at the time and wasn't a heart attack.I vowed that I would lose wait and eat better. I think I gained 10lbs since then. Jeezuz chryst, child. That's scary as all getout. I'm really really happy you're OK and it was just teh indigestion. You did the right thing. I would have logged into WebMD, myself. I wonder if that would have killed me. Glad you're OK, handsome. PS. That roommate of yours has privatized his blog again. What gives?